Recently one of my training partners was very kind to offer me a bar of Arm Bar Soap to review for the site. He loves the stuff and always raves about it in class, so I was excited to give it a try. But does it live up to the hype? Find out below. 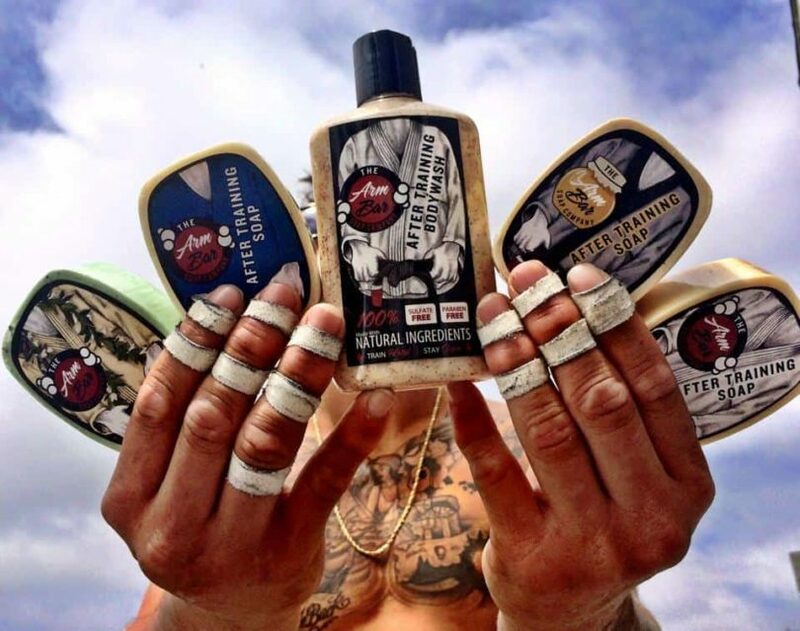 The Armbar Soap Company is the brainchild of Chad Hospodar, after he wanted to find an all natural solution for keeping those nasty mat bugs off your body. After hunting the internet for anti-fungal wash, he found that most of them either smelled horrible or didn’t sud vey well so they weren’t actually good for cleaning. So The Arm Bar Soap Company was born. You can regularly find The Arm Bar Soap Company’s name adorned to the Gi‘s of big name fighters including Keenan Cornelius, Darragh O’Conaill and Lucas Lepri, and now I get to be one of the lucky few to try this product. My initials impressions of this product were great. The packaging looked great and it was finished to a high standard. You actually get a lot of soap for your money. After a hard training session I ripped open the protective plastic to be welcomed with a heavenly smell of my Acai Batch. The smell was so delicious that, for a moment, I had a huge urge to devour the soap there and then. Thankfully I didn’t because I don’t think it would have tasted as good as it smelled. Once in the shower I started the lather up and noticed the welcome addition of natural exfoliants, which don’t only remove any skin and scrub my body well, they are also good for the environment, which is obviously a plus. Overall I am very happy with the Arm Bar Soap company’s product, so if you want to smell amazing after training you can order it from their official site here, or if you’re in the UK you can order it here. I first ordered from the Arm Bar Soap Company about 18 months ago when they first released the AB New Era SnapBack. Being a New Era collector & a keen fresh Jiu Jitsu practitioner it was the perfect gift to myself! With that I ordered a dozen mixed batch of soap & 2 small patches…. First thing that impressed me was the great customer service making the order, all questions answered promptly & Chad made ordering a custom order so simple. Second thing that really impressed me was how fast my order got to me, 5 days to my doorstep! As I opened my order The first thing I could see was the hand written note on the back of one of the many stickers added in to my order, which to me goes along way, a very nice touch & I’ve kept everyone from the 4 orders toArm Bar Soap Company I’ve made. 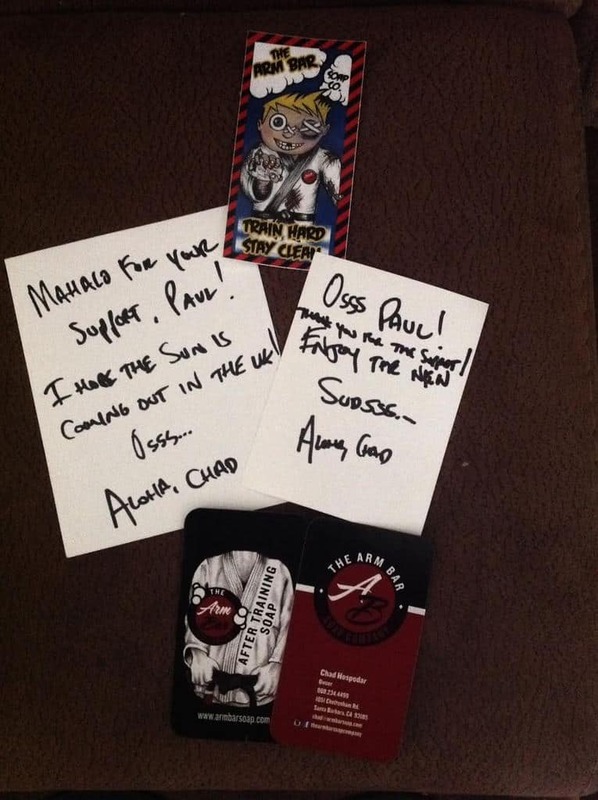 In my first order there was a patch missing so I emailed Chad & within a week I had another 2 patches, more stickers & a hand written apology through my letterbox. To me as a company owner myself that level of customer care was outstanding. Every product purchased from Soap to shampoo bars to hats to patches & stickers has been of the highest quality which has always had me coming back to Chad & theArm Bar Soap Company time & time again. Deliveries have always been fast & hassle free. I’ve never been stung with customs/tax charges either. I highly recommend the Arm Bar Soap Company products to all my mates wether they train or not, great value, great products from a great company.